Thanks to shows like “American Pickers” and “Storage Wars” there has been renewed interest in the lost art of “picking.” While millions of Americans are now paying more attention to the items they find at thrift stores and garage sales, some people have just been incredibly lucky. 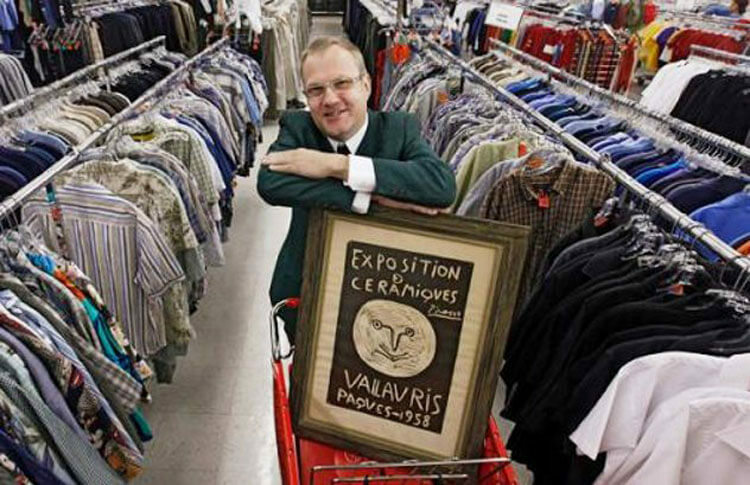 We compiled a list of the most outrageous thrift store and garage sale finds of all times. By spending just a few dollars, many of the people on our list became incredibly wealthy. From $200 million photographers to unearthed copies of the Declaration of Independence, you won’t believe what they thrifty shoppers bought without knowing what they were getting. You’ll learn which things you should never get rid of! Zachary Bodish was sifting through various items at a local thrift store in search of some kitschy art to resell. He eventually stumbled upon a poster advertising an exhibit of Pablo Picasso. He loved the art and purchased it for $14.14. While he was investigating the piece, he noticed red marks on the bottom of the poster. He believed the marks could be Pablo Picasso’s signature. Bodish showed the poster to art experts and discovered it was a linocut. Picasso had carved a design into linoleum, which was then inked and pressed onto paper. Only 100 of the posters were ever created and Bodish had accidentally purchased print number 6. Bodish sold the print for $7,000.